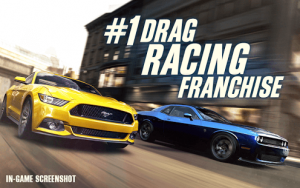 CSR Racing 2 : The next chapter to the #1 drag racing series of all time has arrived! CSR2 redefines what you thought possible on mobile, with stunning detail on all your favorite cars. Meticulous level of detail inside every car, incl. original manufacturers’ trim options. Racing doesn’t get more real than this! Race towards a new challenge! Compete against opponents from around the world or race against friends in real-time challenges. Cars can be customized with a wide range of paint, rims, brake calipers and interior trims just like a real car. Personalize your car with paint wraps, decals and custom license plates! Car upgrades are only the start. You can now get under the hood to tune gear ratios, tire pressure, nitrous boost settings and much more. Stay competitive by stripping surplus cars for parts, and fuse them into your favorite vehicles. Collect beautiful supercars and show them off in your huge warehouse garage. Prove your skill in fast-paced, synchronous multiplayer challenges. Master the unique timing of each car to come out on top. Chat with other players live, and join a crew to roll with your friends. Compete in fresh and exciting online events and increase your rank on the PVP leaderboards. Compete in single-player Crew Battles across stunning race environments. Work your way from rookie to pro by defeating the top crews in a city where nothing is as it seems. Can you uncover the truth? Keep an eye out for events to earn extra cash for upgrades and win rare parts for your rides. New events added daily! PLEASE NOTE! Must be 13+ to play. CSR Racing 2 is free to play, but it contains items that can be purchased for real money. You can toggle these purchases on/off in the “”Restrictions”” menu on your device. Bring to life your childhood dreams by owning and restoring iconic cars from the 60s-90s in the biggest expansion yet! Take on the challenge of restoration to unlock the jaw dropping McLaren F1 and experience the brand-new single player campaign, cinematic Storm Drain Track and Legends Studio! 15 classic cars available for the first time in game!